The Kidlutions children's music CDs awards were voted by a licensed child and family therapist, as well as a committee of conscious parents.The Kidlutions award centers on products that focus on raising children with healthy self-esteem, and products that build character, focus on inclusion, manners, sharing, healthy communication, tolerance, respect, caring and love. Through these quality products, children are encouraged to reach their full potential. 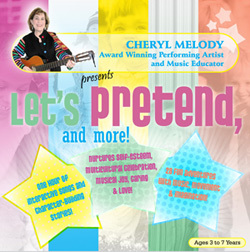 In addition to the Kidlutions Music Awards, Cheryl Melody has also received the coveted Parents Choice National Award. Introduction: My authentic middle name is Melody, and music is in every one of my cells. I have been singing in front of people since I was 3 years old. My mother was an opera singer, actress and writer, and my father was a poet and a jeweler of hand-created products. I share my personal story so that you can gain a glimpse of who I am, how and why this music has been created, and why it could have an important place in the life of your child. The struggles of childhood bullying, and music's magic. When I was a child, I experienced bullying, teasing, isolation. I was teased because we weren’t as wealthy as others and because my grandparents didn’t speak English. I kept this torment to myself, not sharing it with my family. I tried to spare them. Since music was the one thing that really spoke to me as a young girl, I know that it would have been a life saver if I had been introduced to songs which could have encouraged me, given me guidance during these hard times. I would not have felt so alone. The hurt that I had experienced from being bullied became my own healing, however. Through specific original songs like “The No Bully Rap-Song, I gain inner satisfaction from helping to create a more aware human being. I strive to reach the inner awareness of a child who experiences…as Oprah would say… that “light bulb moment of… “Aha!” Perhaps the child will suddenly realize that words CAN hurt, and maybe they will choose to not be as mean to Johnny or Joanie. I recall the wounds of my childhood, and BECAUSE of these wounds, I have created the type of songs that come from my essence, my core, my life experiences, and my education, with both a Bachelor and Masters Degree work in the field of music education and creativity. Each song is a result of my life as teacher, mother and “perfectly imperfect” human being, who is still in the process of growing and learning. One of my sincere intentions as a recording artist, composer, educator and human being is to help children feel that they are never alone. I do it through the warmth of my interpersonal oral and vocal style, my open heart, and the quality and intentions of each song I write and sing. Each children's music CD grows WITH the child, and nurtures from inside out. Each CD is also filled with opportunities to dance, sing, and imagine with delight! I have a passion for singing and teaching small, important ways to make a better world… an internal personal world which can help to create a healthy planet. I believe that music for children can be a catalyst for positive growth, if it is healthy and purposefully-written music, and if it speaks to the child’s world. If the lyrics in music for children shifts one person who was about to tease, bully, gossip...then my investment in creating these CDs and concerts will have been worth every bit of energy. As an early childhood specialist for 25 years, I also know that current research states that children introduced to quality music at an early age will benefit in ways that many other modalities cannot: Music can help children learn more effectively, read with greater comprehension, listen and observe more acutely as sensitive human beings, and become expressive music makers--IF we feed them the food of music at an early age. I experienced a mean, strict piano teacher when I was about 8 years old. She made me play the same note on the piano over and over again until “it had the perfect tone.” She also hit my knuckles when the tone wasn’t “perfect.” Thinking about her makes me shudder right now. As a college music student and cellist, the goals of perfection seemed to take away the joy and passion I had once experienced for the cello. As I played a piece on my cello in front of the student body, the professor took apart each note and each phrase, until there was nothing…no joy, no passion-just fear, worry, concern, terror, embarrassment. Once again, these kind of negative experiences taught me how NOT to teach, how NOT to be! My personal goal is to encourage children and adults to explore the music inside of them without fear of right and wrong, and not to worry about perfection. It is your birthright to make music, to sing, to dance with joy! It is our birthright to sing! It is our birthright to be music makers, sound makers, and my goal is to provide music and words that provide the comfort to express yourself without self judgment. My intention is to provide an open, warm, loving environment to own your birthright, encourage your children and the child inside of you to enjoy the pure glory of the vibration that sounds can provide within your body and outward. In my wildest dreams, I never expected to become an independent recording artist, a national performer or a composer. Through the years, my primary definition of myself was that of TEACHER. As a teacher, I founded an early childhood music school called The Children’s Music Workshop. Teaching children is like breathing for me…natural, easy, effortless, from the heart. I could have been happy with the role of “teacher” for the rest of my life-happy, but not complete. While feeling a sense of deep appreciation for the actualization of The Children’s Music Workshop, I also began to feel restless. I sensed that I had many other dimensions within myself that I needed to express. Songs with messages for nurturing my own growth and a child’s growth were coming through me at traffic lights, as I was driving, waking up, everywhere. Songs like “I’m an Amazing Person Today,” “One Planet,” “You Can Do Anything,” and “If You Have a Dream, and each song encouraged, inspired, taught, and mirrored warmth and love. I wanted each child or adult listening to the CD to feel that I was their friend. I wanted a child to never feel lonely. Children responded enthusiastically, while their parents praised the messages of the lyrics in each song. The goal of having a child feel that they had a friend in Cheryl Melody was something that was verbally shared with me over and over again. It felt wonderful. I went with the flow of what was happening to me, not really knowing where the composing was leading. I also had a lot of resistance towards the unknown. It felt as if I were trying on a new coat or two, and I felt fearful. The old coat felt so much more comfortable. It is also hard to know when to close the doors to something you still really love doing. It is hard to disappoint people who wanted The Children’s Music Workshop to go on forever. I had heard the saying…”when one door closes, another opens,” but several years passed before I was brave enough to open another door permanently, and close this one. 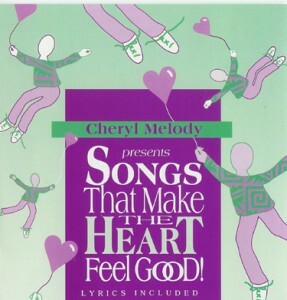 I continued to teach at The Children’s Music Workshop, while simultaneously creating my first CD, “Songs That Make the Heart Feel Good.” Both adults and children seemed to delight from the music and messages on this CD. I thought just creating this album would be sufficient for me. I could keep my School AND have the CD that expressed the essence of developing self-esteem, potential and creativity. However, adults would come to me and ask me where I was performing these songs. I heard this question as “a message” that it was time to perform as well as to teach and record. People urged me to create a concert that reflected the messages of the new songs. One morning as I lay still, I could envision the “MUSICAL IMAGINATION ADVENTURE CONCERT,” and shortly after that, I began to perform this delightfully well-received interactive program. The Birth of "World Peace-The Children’s Dream"
During the same time period, I was introduced to Robert Silverstein, a peace maker, writer, children’s composer and all round great human being. We began to e-mail, and one magical Thursday when I had a day off from The Children’s Music Workshop, he asked me to look at a children’s story he and his friend, Steve Diamond, had written called One Day in Peace (www.oneday.net). As I read the story on the internet, I could hear music in my head. I flew over to the synthesizer I had bought the week before without knowing why I had purchased it! Out of my fingers came two songs, “The World Peace Anthem” and the “One Planet” song. I could sense that this was a project that was supposed to be part of my life in some way. 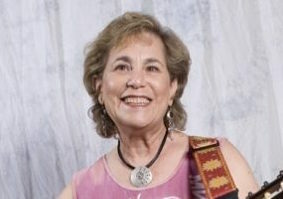 During this time period, I was also invited by Dr. Norma Leslie to sing my Peace songs in the amphitheatre of the University of Oklahoma shortly after the horrendous bombing. She had ordered the CD’s, “Songs that Make the Heart Feel Good,” “Voice of the Angels-A Healing Journey” and “World Peace-The Children’s Dream,” and felt strongly that the songs could help heal some of the pain and darkness. As I stepped onto the outdoor stage, a butterfly landed on my microphone and another one on my shoulder. I looked at that butterfly as a sign that I was in the right place for reaching out with my heart and my music. As I sang the ONE PLANET song, I witnessed people singing and coming off the bleachers in order to hug one another and shake hands, unifying in the experience of love, hope, healing and deep pain. As I viewed this miracle, I knew…I could feel my PURPOSE on earth…to unite, to help heal, to open hearts…through my music, its messages and the way I love to communicate and reach out. It was an awareness that changed my life forever. Then I received “the call.” I received a call from Sr. Ellie Daniels from the Sisters of St. Joseph, asking me if I would be willing to perform “Peace Begins with Me” for 35 schools as part of a Grant. She said that they wanted the messages that were in this concert… messages of hope, empowerment, and making a positive difference by what we choose to say, do, think and feel towards ourselves and each other. This important call meant that I could not maintain The Children’s Music Workshop schedule while doing those important concerts. It was the call and the timing for which I had been waiting. It was time to close the doors to the School. I said yes, and began to transition myself and the families who came to me. 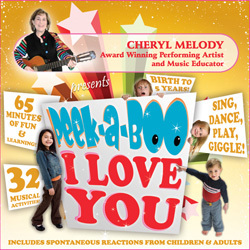 Before I closed the doors, I created 2 more CDs, “Peek a boo, I Love You” and “Let’s Pretend, & More.” These two CD’s contained over 60 songs that I had sung at The Children’s Music Workshop. They are the next best thing to having me teach a child in person. I felt relieved that I had created this concrete solution for the school’s parents and their children as I closed the doors to the school they loved so much. I felt free to move forward with new professional adventures now. What magic in life! The ironic part of stepping into my new concert, “PEACE BEGINS WITH ME,” was that in June of 2001 we had created the schedule of concerts…the first concert was to begin on September 12, 2001. Little did any of us know that this concert would take on a new meaning of importance. The tragedy of September 11th in New York City happened one day before the debut of my first program of the Grant. There I was on September 12, 2001, attempting to perform this Concert, and to put aside my own broken heart in order to give the children and adults a sense of hope and empowerment amidst the chaos they were experiencing. Now I understood. I understood that this program was “bigger than me,” and that I need to follow it wherever it takes me. This concert continues to evolve. It is one that teaches and entertains, builds character, nurtures hope, respect, love and peace within ourselves and in our world, one person at a time. It is a program that is for every one, and one that helps me remember how to BE the change I am asking from others. Out of this program evolved the birth of my CD called, “Celebrate Peace!” The entire CD is filled with the songs I sing in my Peace Begins with me Concerts and Ceremonies. Titles of songs like Mother Earth, Father Sky, One Planet, If You Have a Dream, Peace is a Verb, The No Bully Rap, Simple Gifts, Stand Proud, Shake Your Own Hand…all reflect the vital messages that come from the deepest place of my heart and life experiences. I feel a sense of personal peace that these songs are on this CD, a living, breathing representation of all I believe we need in order to create a respectful life to ourselves and to each other. It is for children and adults, a whole family or school experience, and a reflection of all the songs that I perform in my concert. 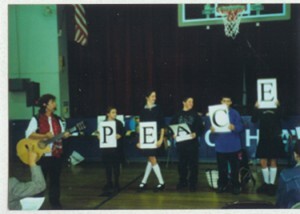 I have since performed the “Peace Begins with Me” concerts wherever I am asked. I perform it in schools, libraries, churches, synagogues, spiritual centers, anywhere and everywhere. Ever since I was 3 years old, I felt I was on a mission, a global mission. I am still not clear how far reaching this vision will take me, but I do feel that this theme and these songs, my heart and my life perceptions are a large part of my Purpose in life. While the Peace Begins with Me concerts are a vital part of my life, it is also important for me to balance myself by continuing to work with early childhood as well. 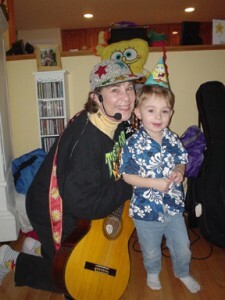 I continue to perform “Musical Imagination Adventure Concerts” for little children, as well as performing personalized birthday parties filled with Music, Movement and Imagination delight! I have such fun, and the children bring lightness to my heart. When I perform these programs, I myself am a child again, happy, carefree, innocent, creative, open, loving, energetic! I have such fun singing, dancing, taking out my puppet, “Shy Mousie,” offering imagination opportunities and storytelling, microphone time, parades…it is hard to believe that I get paid to do such a wildly delightful job! I also continue to teach workshops and seminars, compose personalized songs for websites and for children and adults, compose each day, creating new songs for my future CDs, and continue to perform in adult venues as well. I am open to the unknown, and try to listen to my butterfly spirit. I hope you will listen to your butterfly spirit too. The early childhood CD, “Peek-a-boo, I Love You,” contains words that are “healthy” for little ones to absorb, and is also filled with 32 activities that can enhance a sense of beat, rhythm, tempo, melody, creative movement and nurture self-esteem. After this 1st basic CD, all the other CDs that I’ve created add to this basic foundation, and enhance your own efforts for raising children that are conscious, sensitive, healthy human beings, both inside and out. 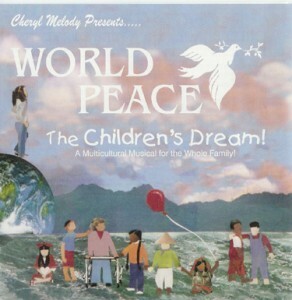 “World Peace-The Children’s Dream” “Celebrate Peace!” “Songs that Make the Heart Feel Good!” “Peek-a-Boo, I Love You” “Friends Forever" and a relaxation CD for adults...and in all songs that are being created for the future. Here is my latest CD, "Friends Forever," filled with themes about inclusion, friendship, self-esteem, effective communication both non verbally and verbally, teamwork, love, caring, sharing, creative writing and reading...all within a child's world. It was a story that needed telling, and this project took me a year and a half. I am thrilled at how this project actualized and all it offers children, and I want to thank Ernestine Benedict for its seed, Zac Cataldo for his expert engineering, and his children, Jaramie and Jesse, for helping me with this meaningful and joyful project. I offer my CDs, songbooks, plays, concerts, workshops and keynote speaking to you, accompanied with my oath that they are coming from the most sincere part of my authentic self. All the music comes from my belief that music has a healing power, that words can heal and create awareness, and that each person has a right to express themselves freely, without fear of right and wrong and perfection. Every song comes from the core of all of my knowledge, expertise, experience, heart, wounds, joy for music, lightness, creativity, seriousness and sensitivity. The songs are ageless. An adult enjoys them as much as a child, and is a natural way to reach the heart of both child and adult. I am grateful to be able to share my Gifts with you. In my website, you will hear sound samples of each CD. If you need guidance as to which CD would fit your needs, please let me know. We will work together to find the music that can help reinforce the joy and intentions of your own heart into the hearts of the children that surround you. Founder & Educator: The Children’s Music Workshop-Birth to 6 with adults. Original, interactive sing able songs! 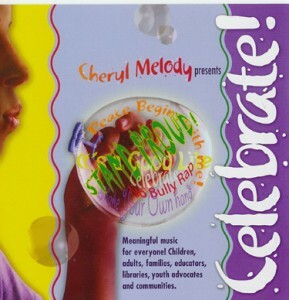 Lyrics celebrate self-esteem, potential, creativity, conflict-resolution, non-bullying, approaches, diversity celebration, respect for self, each other and the earth. 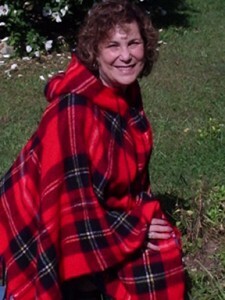 "Voice of the Angels-A Healing Journey"